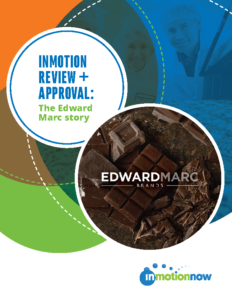 Before inMotion, Pittsburgh-based chocolate retailer Edward Marc struggled to keep up with the demand for more creative assets across many different product lines because of a manual approval process that caused major headaches. But today, thanks to inMotion’s new Review + Approval capabilities, the creative team at Edward Marc has easier review cycles, gets clearer feedback, and delivers content to market, faster. Find out how Edward Marc met their goals with inMotion.